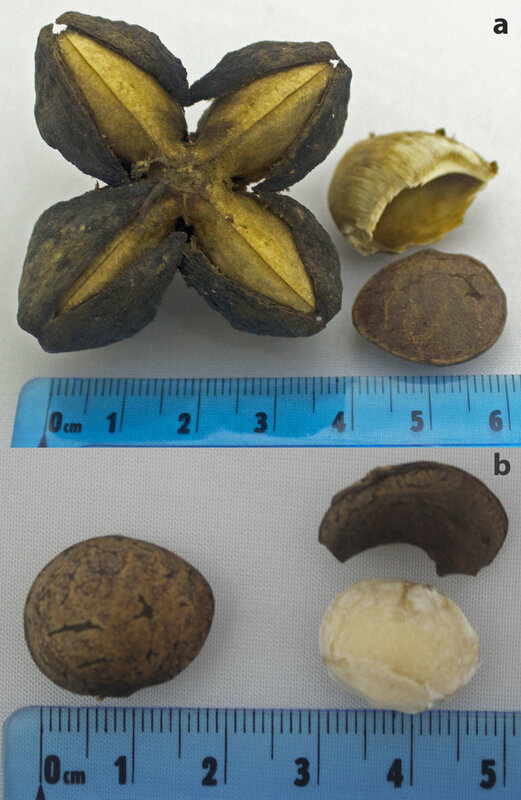 Figure 1: Photo of green, immature Inca nut fruit. Source: ECHO Asia. Inca nut (Plukenetia volubilis) is a forest plant from the South American Amazon where it has been used as a wild food source for over 3000 years. It is gaining attention as a valuable vegetable oil crop, and is now being grown more widely. 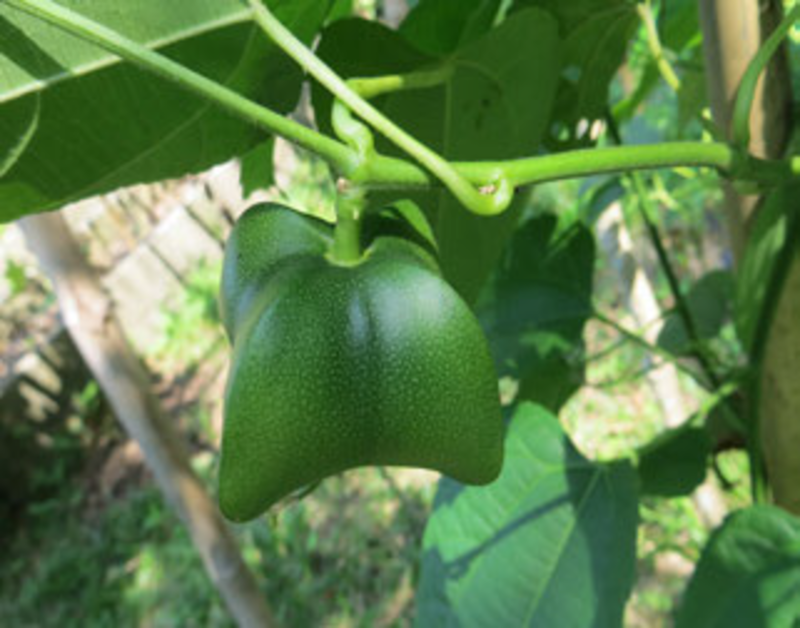 ECHO recently obtained seed from Southeast Asia, which we are growing out in a small planting on our demonstration farm in southwest Florida (Fig 1 and 2). From our limited experience, it seems that Inca nut could easily be grown by small-scale farmers, either for household use or for potential income generation. Figure 2: Photo taken in October 2015 of an Inca peanut planting seeded at ECHO in September of 2014. Source: Tim Motis. Inca nut is also known as sacha inchi, sacha nut, inca inchi, or mountain peanut. This perennial climbing plant is in the Euphorbiaceae family. Flowers appear in clusters, with both male and female flowers on each plant. Pollination results in star-shaped fruits that start out green and turn blackish-brown when ripe. The heart-shaped leaves are edible when cooked. However, Inca nut is grown mainly for the rich oil (35-60%) and protein (27%) content of the seeds. The protein is highly digestible and rich in essential amino acids. The oil from the seed has a mild flavor and is a rich source of omega fatty acids (Guillén et al. 2003). For these reasons, Inca nut has been marketed as a health food supplement. The material that remains after removing the oil from the seeds is used to make flour (also called “protein powder”). The oil and flour are incorporated into various foods and beverages. Although Inca nut has been cultivated for centuries, little was known of its chemical and nutritional characteristics until more recent years. These attributes have now been documented more extensively (Guillén et al. 2003; Huaman Saavedra et al., 2012; Nascimento et al. 2013). In a study on the safety of Inca nut oil and sunflower oil, biochemical indicators of liver and kidney health were unchanged in adult human subjects who had received a daily amount of 10 to 15 ml (2 to 3 tsp) of Inca nut oil over 4 months (Gonzales and Gonzales 2014). In that study, some participants reported nausea after eating both Inca nut oil and sunflower oil, but this effect declined with time and Inca nut oil was well-accepted after the first week of consumption. We did not find any reports where oil consumption by human subjects was trialed over a long period of time [feel free to let us know if you have more information]. Inca nut grows best in warm climates, at low elevations and in acidic soil. However, with sufficient water and drainage, it can grow up to an elevation of 1700 m (5500 ft). With its vertical growth habit (Fig. 2), a lot of seed can be harvested in a small area. Figure 3: Top: dry fruit with seed removed from seed pod. Bottom: Seed with kernal removed from seed coat. Source: Tim Motis. After clearing weeds/grass from an area, plant the seeds 2 to 3 cm deep at the beginning of the rainy season. Yang et al. (2014) compared 5 planting densities ranging from 1,666 to 10,000 plants/ha. They found that oil production was highest with 4,444 plants/ha, which can be achieved with plants spaced in a 1.5 m X 1.5 m grid. In a warm climate, all or nearly all of the seeds should germinate in a few days. Germination reached 93% in a study done in China, with a temperature of 25 to 35 °C (77 to 95 °F) being most favorable for germination (Gong et al. 2013). Rosa and Quijada (2013) found that germination was actually better without than with the shell (seed coat), a finding attributed to the slowing of moisture absorption and gas exchange by the seed coat. Figure 3b shows a seed kernel with the outer coat removed. It is also possible to speed up germination by “scarifying” the seed, nicking the outer shell so that the seed can absorb water more quickly after planting. Weed and water as needed, and supply plenty of fertilizer or compost. In China, seed and oil yields increased (from 1,340 to 2486 kg/ha and from 501 to 899 kg/ha, respectively) as the rate of NPK fertilizer was increased from 0 to 200 kg/ha, showing that Inca nut responds well to fertility inputs (Yang et al. 2014). Once established, the well-developed roots can withstand drought but not frost (Gong et al. 2013). An Inca nut plant can reach 3 to 5 m in height or even higher. In the tropics, and as we have experienced in Florida’s subtropical climate, the plants tend to produce long vines. Consequently, it is best to provide support for the vines, such as the trellis shown in Figure 2. Plants flower in five months, and seeds are formed by eight months. Once an Inca nut plant begins producing seeds, it can do so almost year-round. A planting in China reached its highest level of fruit production during the second or third year (Gong et al. 2013). To avoid handling the messy pulp in developing fruits, allow them to dry on the plant before harvest. The messy black pulp will dry up. Raw seeds need to be roasted before eating; otherwise, they are too bitter. Roasting at a low heat (below 60 °C [140 °F]) helps preserve the heat-sensitive omega fatty acids. The oil, on the other hand, is made from raw, unheated seeds. The seeds are “cold-pressed” to avoid damaging (via oxidation) the omega fatty acids in the oil (Cisineros et al. 2014). One source mentioned that if not used quickly or refrigerated, the oil will become rancid. Active development workers registered with ECHOcommunity.org (see the website for how to register) may request a trial packet of seed. We would be very interested to hear of your experience with this little-known crop. Cisineros, F.H., D. Paredes, A. Arana, and L. Cisneros-Zevallos. 2014. “Chemical composition, oxidative stability and antioxidant capacity of oil extracted from roasted seeds of Sacha-inchi (Plukenetia volubilis L.).” Journal of Agriculture and Food Chemistry 62:5191-5197. García-Hernández, V.M., M. Gallar, J. Sánchez-Soriano, V. Micol, E. Roche, and E. García-García. 2013. “Effect of omega-3 dietary supplements with different oxidation levels in the lipidic profile of women: a randomized controlled trial.” International Journal of Food Sciences and Nutrition 64:993-1000. Gong, D., Y. Zhang, X. Wang, K. Zhang and Q. Liu. 2013. “Experimental study on introduction and cultivation of featured health-care oil plant Plukenetia volubilis [Chinese].” Acta Agriculturae Jiangxi 25:5-9. Gonzales, G.F. and C. Gonzales. 2014. “A randomized, double-blind placebo-controlled study on acceptability, safety and efficacy of oral administration of sacha inchi oil (Plukenetia volubilis) in adult human subjects.” Food and Chemical Toxicology 65:168-176. Guillén, M.D., A. Ruiz. N. Cabo, R. Chrinos, and G. Pacual. 2003. “Characterization of Sacha Inchi (Plukenetia volubilis L.) Oil by FTIR Spectroscopy and 1H NMR. Comparison with Linseed Oil.” Journal of Oil and Fat Industries 80:755-762. Nascimento, A.K., R.F. Melo-Silveira, N. Dantas-Santos, J.M. Fernandes, S.M. Zucolotto, H.A. Rocha, and K.C. Scortecci. 2013. “Antioxidant and Antiproliferative Activities of Leaf Extracts from Plukenetia volubilis Linneo (Euphorbiaceae).” Evidence-Based Complementary and Alternative Medicine 2013: Article ID 950272, 10 pages. Rosa, R. and J. Quijada. 2013. “Germination of Sacha Inchi, Plukenetia volubilis L. (Mcbride, 1951) (Malpighiales, Euphorbiaceae) under four different conditions. [Spanish].” The Biologist (Lima) 11:9-14. Yang, C. D.Y. Jiao, Y.J. Geng, C.T. Cai, and Z.Q. Cai. 2014. “Planting density and fertilisation independently affect seed and oil yields in Plukenetia volubilis L. plants.” Journal of Horticultural Science and Biotechnology 89:201-207.